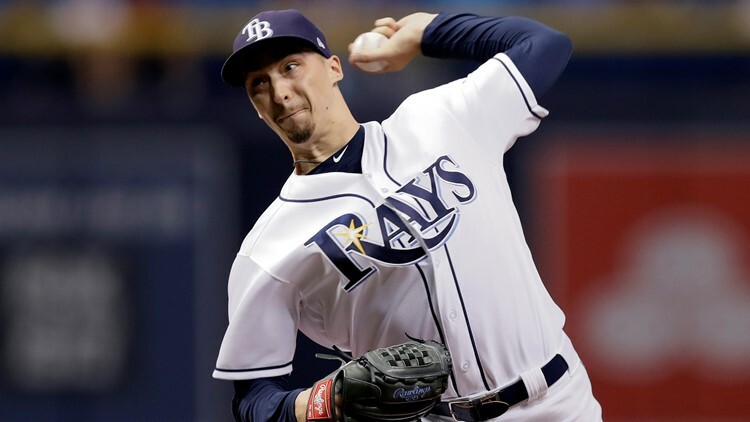 Tampa Bay Rays starting pitcher Blake Snell delivers to the Baltimore Orioles during the first inning of a baseball game Friday, Sept. 7, 2018, at Tropicana Field in St. Petersburg, Florida. The 26-year-old Snell got hurt when he got out of the shower and then attempted to move a large granite item. The reigning AL Cy Young Award winner says it was a "really dumb" move. Snell says "It's like a three-piece set and this pole that comes up like 2 1/2, 3 feet. Went to move it, I lifted it up and it wasn't glued to the pole and the pole came crushing down." Tampa Bay also promoted right-hander Emilio Pagan from Triple-A Durham before Tuesday night's game against Baltimore.